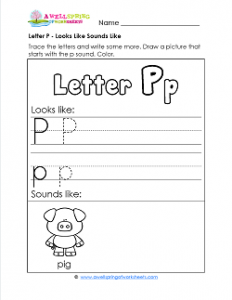 The little piggy on this letter p looks like sounds like worksheet is standing by (since when do pigs stand on two feet? ), looking on, waiting to help your kids with writing their very best ever upper and lower case Pp. Then maybe he’ll pop an idea or two into their heads of something else that starts with the p sound that they can draw next to him on the page. Don’t forget to color, including the “Letter Pp” at the top of the page.